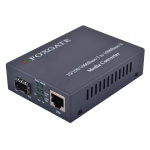 FoxGate OptoNIC 100Base-FX Ethernet adapter, operating at 100Mbps rate and providing transmission band of 200Mbps in full-duplex mode. Network adapters are supplied in different performance dependent on tasks, namely: types of connectors, lengths of waves, range. FoxGate OptoNIC 1000Base-FX PCI-E Ethernet adapter operates at 1000Mbps rate and providing transmission band 2000Mbps in full-duplex mode. Adapter supports IEEE 802.1p standard that allows prying traffic and transmitting required traffic in peaks of network load, and IEEE 802.1Q maintenance supplies VLAN table providing filtration of packages by VLAN marks. FoxGate OptoNIC SFP PCI-E Ethernet adapter for SFP slot, operating at 1000Mbps rate and providing transmission band 2000Mbps in full-duplex mode. Adapter supports IEEE 802.1p standard that allows prying traffic and transmitting required traffic in peaks of network load, and IEEE 802.1Q maintenance supplies VLAN table providing filtration of packages by VLAN marks. Availability of two indicators Link/Act, Power. FoxGate OptoNIC SFP PCI-E Ethernet adapter: 1000Base-SX/1000Base-LX Ethernet adapter, PCI-E, SFP slot.